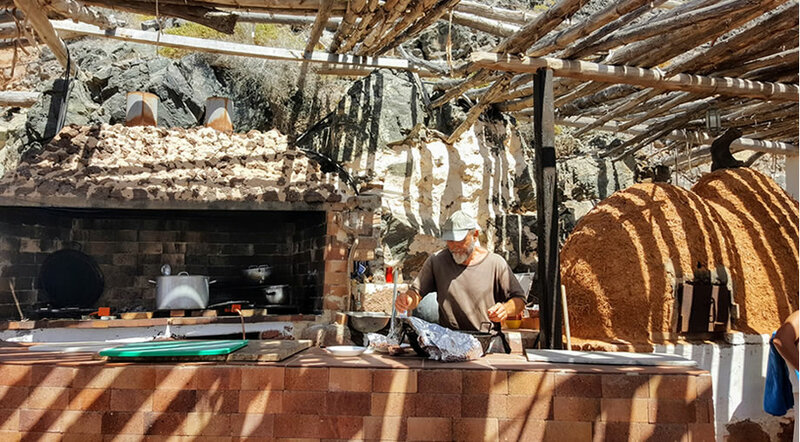 When we were visiting Puertito de los Molinos, one of the best kept secrets of Fuerteventura, we came across a small restaurant called Bohemias del Amor. The entire village has only around 10 houses and less than 20 permanent residents, so you can imagine our surprise when we saw that there were 2 restaurants in this place. One of them, Casa Pon, has a Spanish menu, reasonable prices and it's a regular restaurant, nothing fancy - just as you would expect from a remote place like Puertito. I don't know how the food is, because I did not eat there. I went to the other restaurant. It is called Las Bohemias del Amor. Because it was right on the beach and when we went up to check it out we saw this view. We immediately met the owner, who wears many hats and has many roles. He's also the waiter, the cook and also provides the entertainment in this place. Of course, you will need to speak Spanish in order to communicate with him, but if you do, please don't miss out on this experience. As you can see from the pictures, the restaurant isn't exactly your typical place and I know that many of you may not want to eat in such conditions. The tables are made of plastic, the hygiene is not perfect and there's no menu or variety to choose from. When we arrived, there was a sign with 3 types of food written on it. Paella, gambas a la plancha and something with octopus. The man informed us that he was just starting on the paella and this is what he will serve that day. At that point it was just us and a group of french tourists. The place doesn't have many tables, so by the end I think we were 12-13 clients in total. The cooking was quite a show, as all the cooking was done outside on the terrace. We were invited to taste from the paella while it was cooking and give our opinion. He added one more pinch of salt, then another pinch of saffron. He said that a good paella has to be prepared with love. 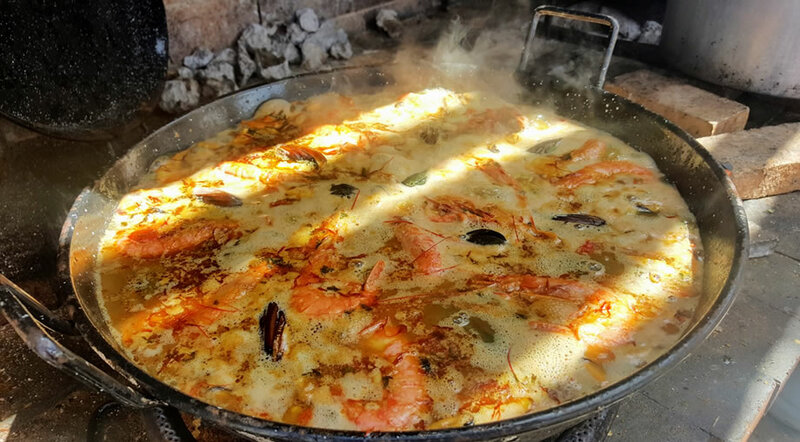 Paella con amor. He disappeared for a while in the kitchen and something started to smell burnt from one of the pots outside. He came running, took the lid off and a black smoke came out. It was the octopus from the menu. He then proceeded to erase that from the sign. He had been right all along. We were all going to eat paella today. During the summer, the restaurant is not open every day and so it doesn't have a schedule. As there are no employees, he opens the restaurant only when he's in the mood for cooking. Today it was going to be only for lunch time. No dinner. During the winter months he said that more tourists come to visit and that it is a different type of tourism. So he hires a German speaking waiter and he has to open every day because he has to pay a salary. But during the summer months he has no schedule, it's only him in the restaurant and he can do whatever he wants. When it's just me working in the restaurant, a day when I have even a few customers, is a good day. And a day when I have no clients is still a good day, because it means that I get to have this beautiful place all to myself. 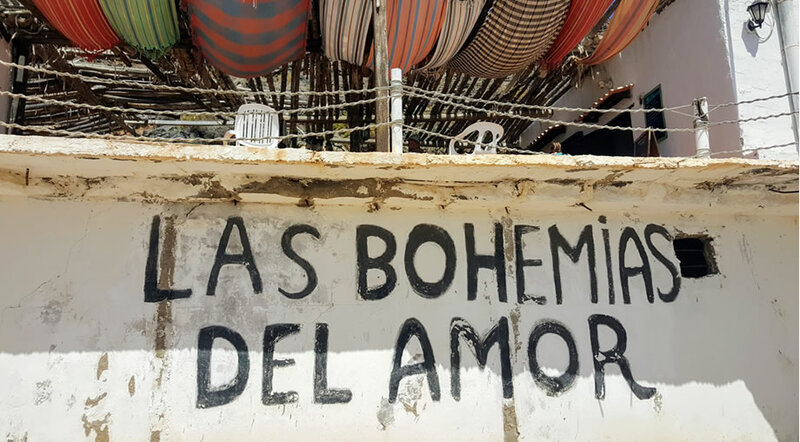 You should go and eat at Las Bohemias del Amor in Puertito de los Molinos. The experience is one of a kind. The entire place is unique, a corner of this beautiful island still untouched by mass tourism. I had the best paella at Bohemias del Amor. No fancy plating, no Michelin stars chef. 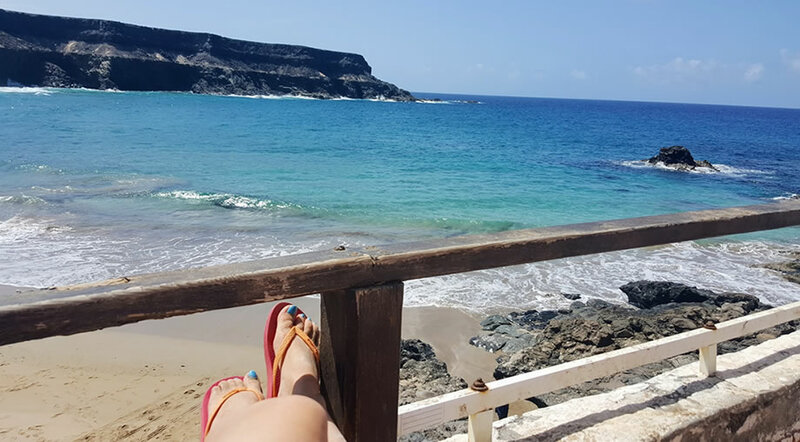 So if you want to try a different kind of restaurant in Fuerteventura, jump in a car and come here. You may have bad luck and find the restaurant closed. But it will still be a good day. Because it means you will have the place all to yourself.